Some accept it without any difficulty, others must look at their policies and alert their staff about the need to check all people for DNR bracelets prior to instituting resuscitation efforts. As I did some online research, I realized many states have particular companies who will make 'DNR jewelery.' Good to know! 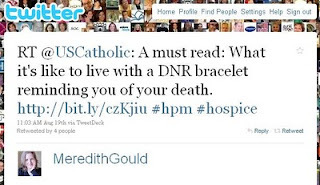 For patients in the hospital, the placement of the DNR plastic bracelet (or sometimes a purple clip on a bracelet) is often an afterthought without much ceremony nor consistent education. Imagine yourself in the patient's role, after a long exhausting discussion (or a brief, confusing short one) about your medical condition and plan for care in the hospital, a nurse walks in 20-30 minutes later and places the bracelet on your arm. Maybe the nurse offers an explanation of what it is, maybe not. You ask about this new purple bracelet. "It's the DNR order from the meeting you just had with the doctor." "Well I don't want this," you reply. I have found without explicitly discussing the act of placing the bracelet, many goals of care discussions have been completely undermined. So now our team makes a point, even thinking of it as a 'check-off' in the wrap-up phase of a family meeting to make sure the bracelet is explained to the patient and the family. Interestingly on occasion discussing this has led some families to actually refuse placement of the bracelet often in fear of upsetting the patient. This of course leads to sitting down and having more discussions. Do you have any tips about working with DNR bracelets? *All mentions of DNR imply Do Not Attempt Resuscitation or DNAR, but DNR is used here as convention. AND if you want to talk about using AND (Allow Natural Death) as a medical order instead of DNR you can see this earlier post.